New from Talk N Text. 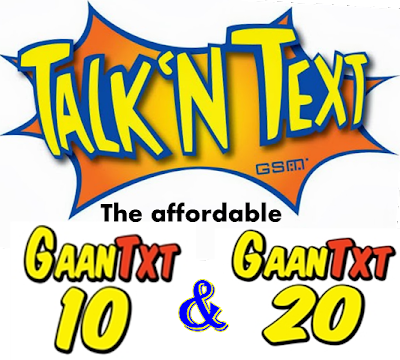 Affordable Talk N Text GAANTXT10 and GAANTXT20 Promo. Gives you number of texts to all TNT/Smart subscribers plus free texts to all networks. Want to register to this? Scroll down below for more information regarding this promo. How to register to TNT GAANTXT promo? Enjoy sending 100 texts messages (SMS or MMS) to all TNT and SMART subscribers PLUS 10 free texts to all networks, and that is valid for 1 day! Gives you 200 Texts to ALL Networks and that is valid for 2 days. Please wait for the confirmation messages before sending texts. Also available TNT GAAN UNLITXT PLUS promo. *This promo is only available and valid to all TNT Subscribers nationwide.